Galbijim is a popular Korean casserole dish made with galbi, generally from beef short ribs and a definite crowd-pleaser whether it's eaten at a restaurant or served at home. It's commonly served as the main dish but leftovers or smaller portions can be served as a side dish as well. During preparation, surplus fat is removed from the ribs by cutting and removing after parboiling. Soy sauce, sesame oil, scallions, minced garlic, pepper, ginger juice, and sugar are mixed together with ribs and slowly simmered in a large pot over medium to low heat to enhance its tender and sweet finish. When the meat is almost cooked, jujube, ginkgo nuts, carrots, and/or pine nuts are be added and boiled once again. 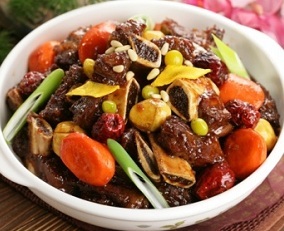 Chestnuts and shitake mushrooms can be also added near the end to bring out extra flavors to this dish. Galbijjim is usually served in a bowl rather than a plate and traditionally served in a bowl with cover.